What with my Firestorm Narrative reports getting such a good reception i thought it was about time i do brief post on the setting of these reports. They all take place in one specific sector of the Dindrenzi Federation which helps to link them all together and helps provide context. Enjoy. Description: Sector 024 is primary a military training sector located on the boarder of Dindrenzi/Directorate space. 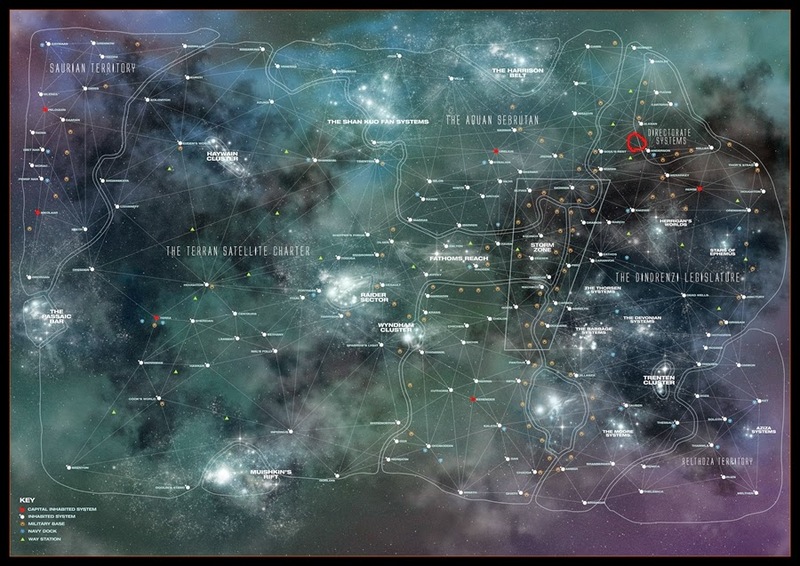 Its location within the Federation makes it an ideal military training sector with most of its systems either used for training exercises or are unexplored, its also close enough to the Stormzone and Aquan oarder sectors to allow relatively quick travel to those locations. Up until recently the sector had seen no combat, with the war raging elsewhere. However there have been reports of Aquan and Terran Fleets in the area as well as the discovery of a Aquan remote science facility on one of the sectors planets , the facility was promptly raided and destroyed by a newly founded Dindrenzi Assault regiment. In addition to this several patrol fleets have been attacked while on training runs, with many of the fleets suffering heavy loses as recently graduated Dindrenzi ships crews battle against trained and tested enemy fleets. The response to these raids has been slow. With the war heating up on the front lines Dindrenzi Glaive Command has been slow to respond to Sector command's request for help, and so Sector 024's trainee fleets and ground regiments find themselves pressed into war far earlier than they expected, pushing their training to the limit. It is unclear at this early stage who will emerge triumphant in Sector 024, or even what the Kurak Alliance's goals are. So far the only sign that Glaive Command has heard Sector 024s cry for help has been the appearance of a RSN patrol fleet in the sector. Upon arrival they immediately made their way to Sector command and began to take over the organization of the defense efforts, much to the frustration of those who had been doing just that. As of yet the RSN fleet, lead by a Admiral Emmy Mcdonough,has yet to engage the enemy and this has only helped to anger those in Sector command who resent their take over of the defence. 1 Fleet, unconfirmed size. Some reports have it at Battle Fleet Size others at Patrol Fleet Size. From the above report it becomes clear that Sector command has no idea of the enemy forces current operating in Sector 024, this has seriously hampered efforts to combat the enemy forces as Sector command was unwilling to commit their meagre forces to a fleet/ground battle where the enemy may well out number them 10 to 1 and were just waiting for more Zenian League forces to run into their trap. However operations are being planed to try and gain more Intel on enemy forces in Sector 024, and if these operations prove to be successful this could well turn the tables on the Kurak Alliance forces. 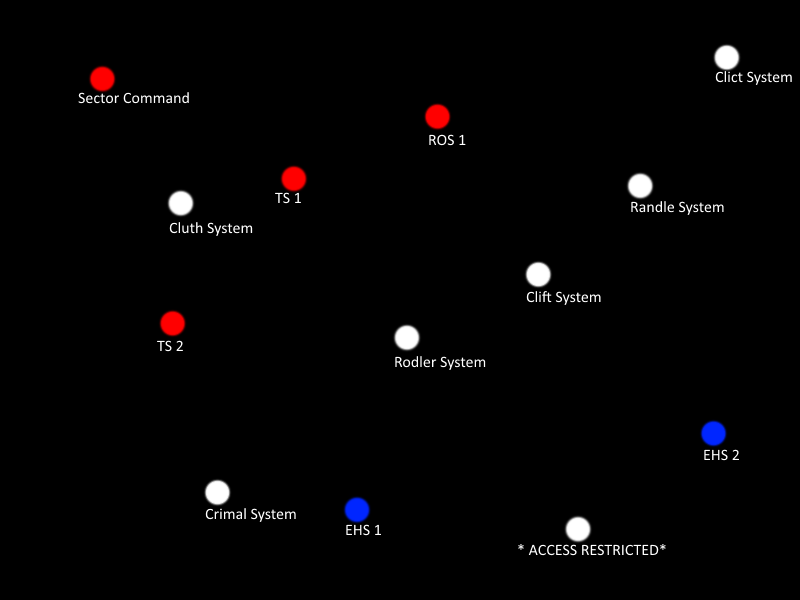 White: Uninhabited Systems, these system haven't been claimed by the Dindrenzi and there have been no reports of enemy actively on them, yet. System *ACCESS RESTRICTED* requires tier 1 security clearance to access information relating to it. There you have it, the background for the setting of my Firestorm Narrative reports. Speaking of the reports the next one will involve both Firestorm and Planetfall and will probably be spread out over 2 posts.Until next time.